It was a ceremony filled with many chicken-skin moments as the 41 Moloka‘i graduates received their hard-earned college diplomas last month. 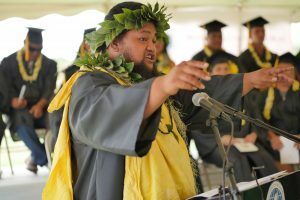 They were among 116 residents who completed their degrees between 2012 and 2016 through the Moloka‘i Education Center, part of UH-Maui College. The commencement, held every four years, honored recipients of 87 associate degrees, 17 bachelor’s degrees and 12 master’s degrees. The graduates ranged in age from 17 to 59, with 75 percent of them Native Hawaiian.